Punk styles you can make. Punk clothing is all about doing it yourself. Take something old and upcycle it into something new that says more about you. Go trash punk or glam punk, or any punk in between. Do you have a favorite brand of chips? 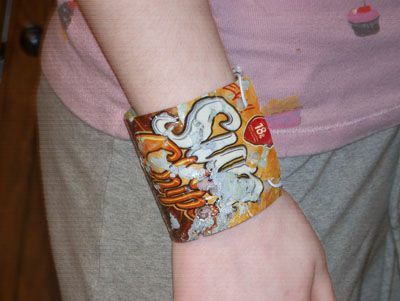 make this funky armband bracelet out of a bag of your chosen snack food. Any plastic snack bag will work. You will be shrinking it into a thick piece of plastic. A belt made of neck ties is an easy way to add a funky flair to any outfit. They have been customized and worn by stars such as Liv Tyler. Ties come in so many different patterns and colors, so it’s easy to get creative with this one. With these easy steps, you'll have a new belt in about five minutes. I recently found these yarn hair pieces selling for $25.00 at a local fair. The thing is, it doesn't cost nearly that much to make these, and they only take a few minutes to put together. Make you own yarn hair extensions with these materials and just a few minutes. You are two t-shirts away from this cute bag. Use t-shirts of contrasting colors, or different screen prints for an original look. There is a little bit of hand stitching, so this is a great project for those new to sewing. Fingerless gloves can turn any outfit into a daring statement. Create a pair of fingerless gloves from a pair of long sleeves. 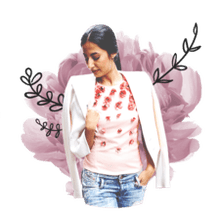 How do you bleach jeans? This is a great DIY project for beginners. You can turn a pair of jeans into camo pants in just a couple of easy steps.